Bring on the apple season! Who says apples only belong in a pie or in a dessert? We love the slightly sweet and savory combination of apples with protein. Completely addictive. 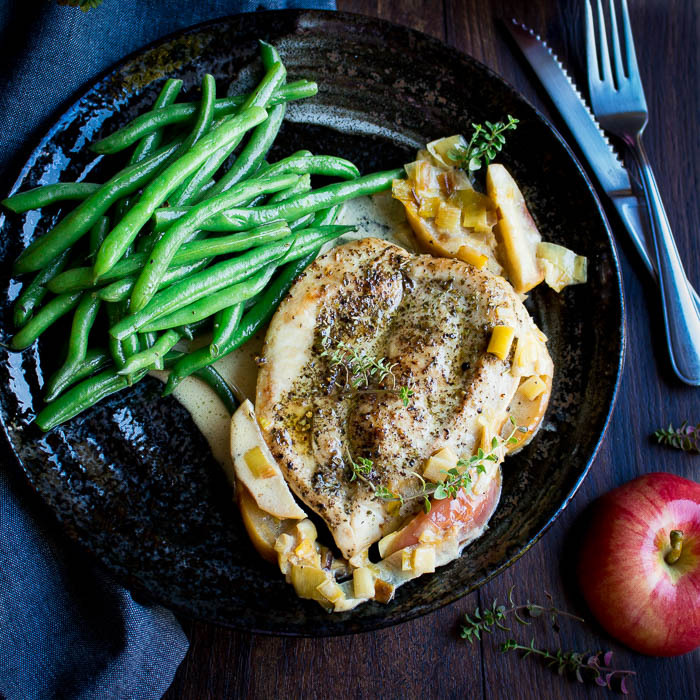 Skillet Creamy Chicken with Apples may also be known as Chicken Normandy or Poulet Vallée D’Auge and other names. A delicious recipe from the Western Northern portion of France, Normandy. 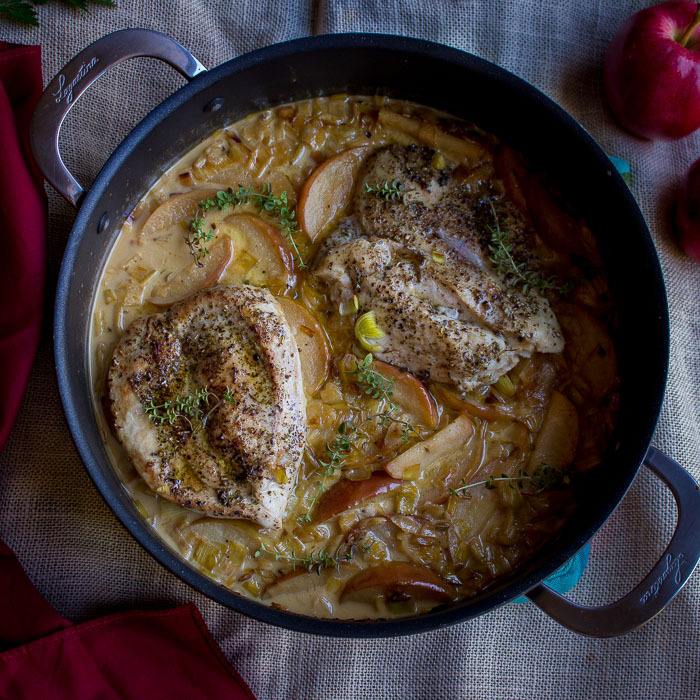 You are going to fall in love Skillet Creamy Chicken with Apples. 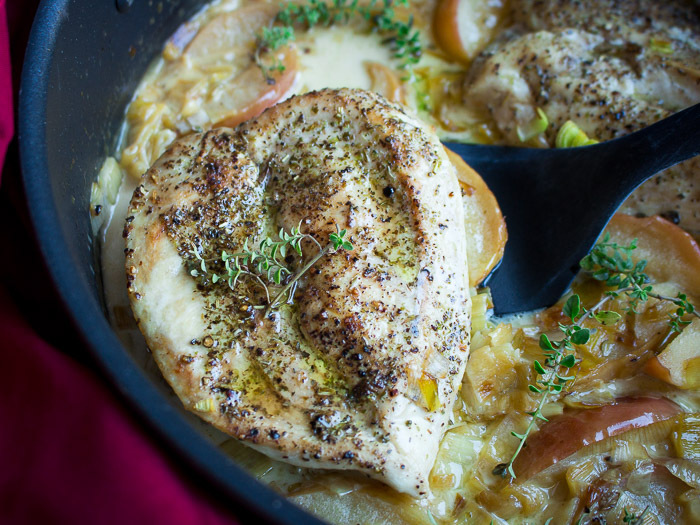 Super creamy tender chicken with the essence of thyme, leeks, apple brandy and apple cider is killer good. Savory, sweet, aromatic, creamy and oh sooo good. 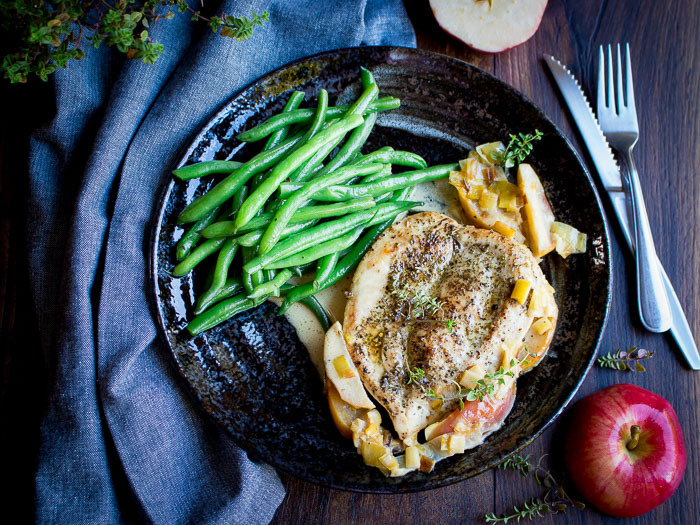 We served our Skillet Creamy Chicken with Apples with a side of sautéed green beans. This dinner was on our table in just under 30 minutes. Great weeknight dinner or even a nice meal with friends. This dish is so easy, it practically cooks itself. Normandy is known for many delicious items such as apples, apple cider, apple brandy (calvados) and of course butter and cheese. We have made our Skillet Creamy Chicken with Apples two ways; traditional and a non-dairy option for those that don’t tolerate dairy well. Both options are gluten-free. Autumn is our favorite time of the year. Do you love sweater weather, changing leaves and super easy harvest meals? You are in luck. Skillet Creamy Chicken with Apples has tender chicken, aromatic herbs, tasty apples and you cook everything in one pan. Easy cleanup and that is a very good thing. If you like the combination of savory apples be sure to try our Meat Lover's Apple Stuffed Acorn Squash and Spiced Cranberry Glazed Ham and Baked Apples. Visiting the apple orchards and getting fresh apple cider and hot donuts is the highlight of the autumn season. We may have over done it with buying a whole bushel but now we have enough apples to make dessert like our apple pie pot stickers, easy peasy Baked Apples, Apple Pie and Chewy Caramel Apple Pie Cookies. If you a looking a true French dessert to finish off your meal be sure to try this Pear Tartin Tarte Poires et Amandes from our dear friend, Sylvie. Flaky crust, delicately sweet and perfect with an afternoon cuppa. 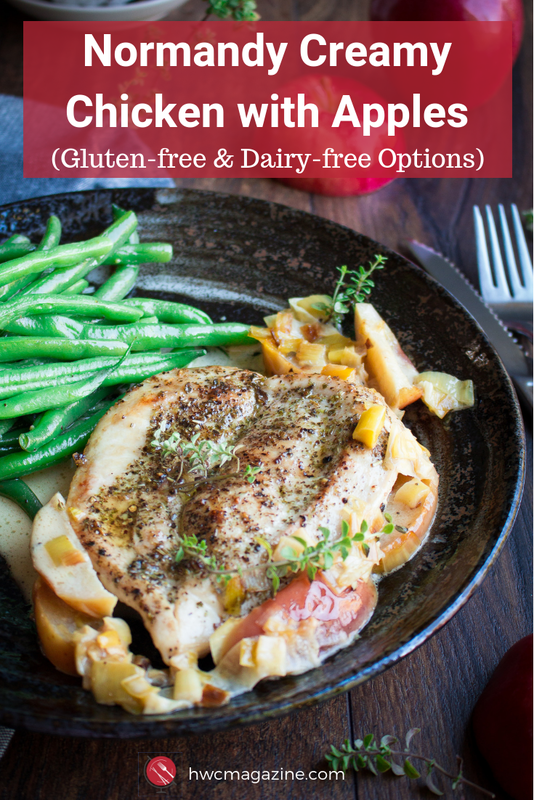 We used chicken boneless skinless chicken breasts only because we have picky eaters in the family but also fabulous with chicken thighs. Simply divine. We used leeks as we had these on hand but also delicious with caramelized onions or shallots. We are all about use what you have on hand. How about you? 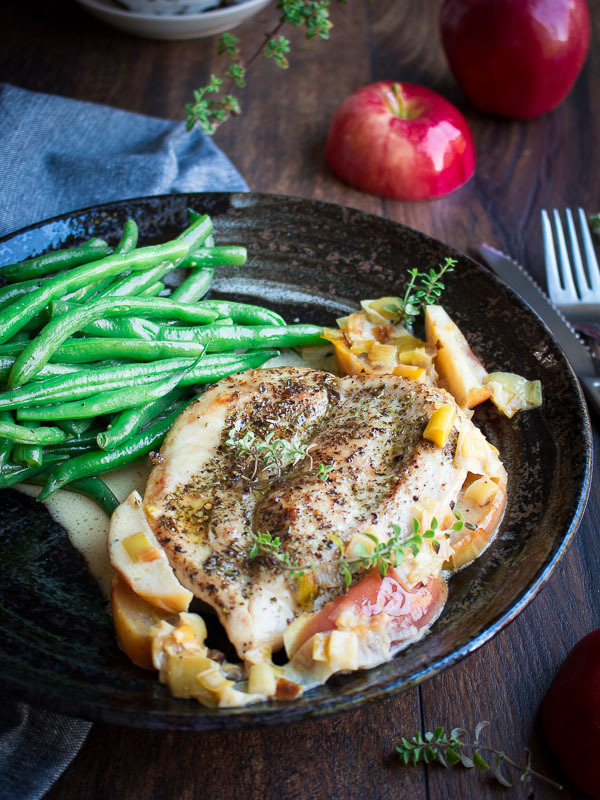 Skillet Creamy Chicken with Apples is super delicious with real cream and butter but if your dairy intolerant we have a quick and delicious idea for you. You can cook everything together until the very end. However, instead of adding cream just before braising we added a dairy alternative like an almond milk. We, then made a little corn starch slurry to make a delicious pan drippings gravy. Be sure to drizzle a little of the creamy gravy over the chicken along with the apples and leeks. Happy Autumn Friends. Be sure to stay in touch with us on Facebook, Instagram, Pinterest , You Tube and Twitter. 1Pat your chicken dry and season with salt and pepper and thyme on both sides. Set aside. 2In a large pan, add olive oil leeks (or onions) and saute until softened and aromatic. Add the garlic. Move your leeks on to the sides of the pan and add in your chicken and brown on both sides for 2-3 minutes on each side. Remove your chicken and leeks from the pan and set aside- keep warm. 3Add your brandy (or apple brandy like Calvados) and deglaze the pan. Loosen all the little delicious bits on the bottom of the pan. Add the apple cider, chicken broth and apples into the pan and chicken and leek back into the pan. Simmer until the apples are fork tender, about 7-8 minutes and liquid is reduced to about half. Season with salt and pepper to taste. 4Dairy Option: Add heavy cream and butter to the pan and increase heat until slightly thickened and delicious. 5Non- Dairy Option – increase the heat to your pan to medium and Add non-dairy milk of choice and cornstarch together to make a slurry. Stir into pan while boiling and allow to thicken. Drizzle with olive oil to serve. 6Garnish with fresh thyme spears and enjoy! 7Chef’s notes. This recipe is also delicious with skin on chicken thighs but you will need to increase the braising time. Feel free to use regular onions or shallots as exchange for the leeks. You can use regular brandy instead of apple brandy or you can skip altogether if you wish. We like to use apples that are a little firmer as it is nice to bite into aldente apple. Gala, granny smith, honey crisp are just a few we like.